In order to leverage social media to fill your sales funnel, you’ll need to invest in a tool that will help your business filter content and target influencers and prospective customers. Many small businesses are using social media to build awareness about their services, but you can go much further and target and engage prospective customers. Before you invest in any of these tools, make sure that you’re also doing the basics when it comes to your businesses’ social media profile and content generation. Branded Profile – All of your profiles are branded and have a consistent look and feel. Social media isn’t any different than your website, collateral or a sales package. Your brand image and message should be clear. Consistent Schedule of Content – You’ll need a consistent schedule of content to nurture your audience and grow your community. Keep your message conversational. Relevant Content – Most businesses have a lot to share. Think about how you can educate your audience and showcase your expertise. For example, if your business targets marketers and small businesses, then your content should help those prospects solve problems and make their day-to-day activities easier. Hubspot’s article on mixing up visual content is very helpful. Assets – Most businesses have many assets already created. Take a look at past campaigns, whitepapers and informational content that you can leverage in the social space. It’s not always about creating content from scratch. Monitoring and Listening – In addition to publishing, you will need to listen and monitor what’s being said about your business and what prospects are saying about your industry. There are several free tools that can help you get into the flow of the conversation. Here are a few lead generation tools that help you find your target audience, engage and fill your sales funnel. Socedo – Is a great tool to use with Twitter and LinkedIn. With this tool, you set up key words that will filter the relevant leads for your business. Socedo allows you to also establish automated messages to start engaging with prospects immediately. The dashboard feature helps you manage how those prospects respond so that you can convert them into customers. I like the free 14-day trial feature, which allows you to take it for a test run. Pricing is based on the number of prospects you generate and is relatively low. Colabo- Helps you find warm leads in various social media platforms, like Twitter, LinkedIn, Quora, MeetUp and others. Colabo can get you in front of leads immediately. The lead alert feature is based on keywords and filters you establish. Pricing is also based on the number of leads you generate and is very reasonable. I like the flexibility of this tool and the wider variety of social platforms it can connect to. Chirpify – is an interesting platform that allows you to listen in social and mobile for triggers and keywords that your business defines, set up rules and automated messaging while highlighting rewards and loyalty programs with mobile and fuel your conversion efforts. 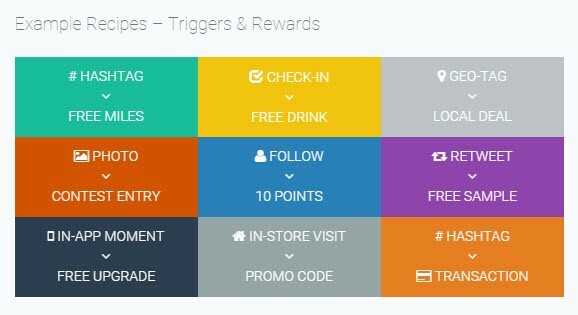 This platform really focuses on taking actions in social and mobile, allowing you to convert into loyalty and rewards. Bigger brands use this platform to leverage what their networks and communities are saying in order to link in to those conversations and offer awards and loyalty programs.